If you have been wearing Gos shoes for a while as I have, you are used to the way his HUD worked and how his shoes were normally sold in individual colors as well as a fatpack. The HUD had to be attached and then you cycled through blue popup menus with names of colors to select your shoe color. Well, Gos has revamped his HUD and changed his selling style as well due to customer feedback. 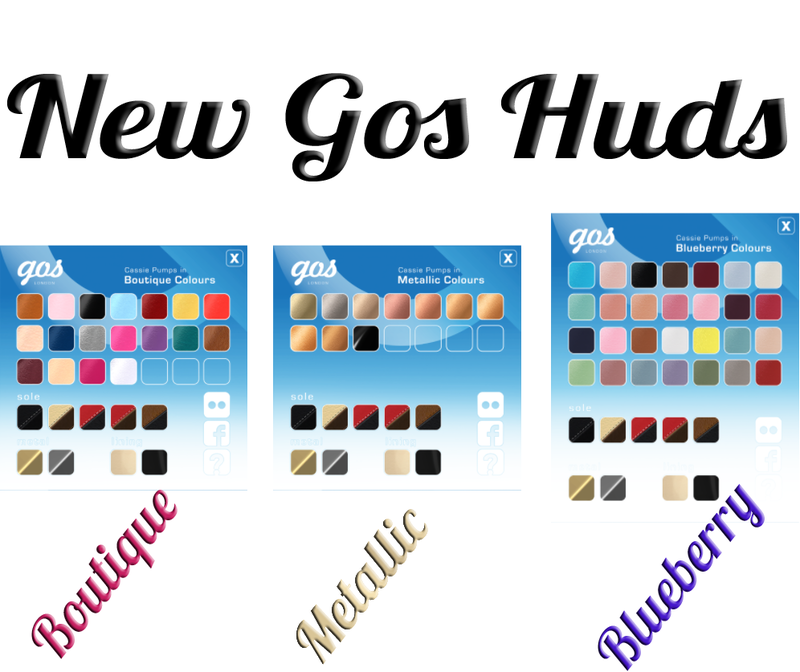 1) Updated HUD- A popular customer request, the Gos Boutique HUD has been updated to use colour swatches in place of names. So no more blue SL menus, just wear the HUD and click on the color to apply. 2) New Packs & Additional Colors- You still get the traditional Boutique colors, but now Gos shoes are going to come with a lot more colors as well. Releases will now be consolidated into color HUDs, including a new Blueberry HUD which includes colors that coordinate with popular clothing releases from Blueberry. I am super excited about this new Blueberry HUD!! I adore the newer Beige Blueberry color and being able to make my shoes that exact shade to match my top in the above picture made me exuberant with joy.